ABCmouse is an English education app. In the United States has an original curriculum, with the Chinese market for brand re-engineering. In particular, a lively 3D character is used in the app. 3D based on 2D design. Because the children are between the ages of 5 and 10, the form is more simplistic in the design process, and the proportion of the nose and mouth is finely adjusted to bring the cuteness to the extreme. 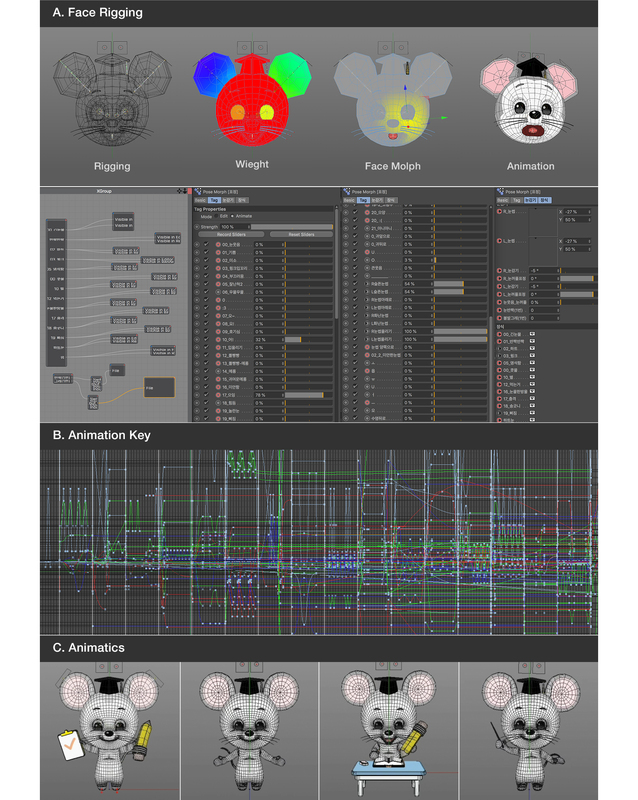 The key to character face animation is to analyze the characters and to define the concepts accurately. ABC Mouse is a friend in educational applications who assists users to learn. Thus, I made assumptions of some interesting circumstances that might possibly happen during the learning process and expressed it in 3D to make it more solid and comic. I supposed various hypothetical situations that students can empathize and expressed the situations as emotions. In terms of animation works, it is important to have a good understanding the overall flow. Animations also have a lot of keys to work with, so it is better to group them to manipulate easily. It was used in the various actions used in the educational app, ABC Mouse prior to making stickers. While maintaining the principle shape of the face, I expressed 16 different emotions in a comic way. Online stickers convey the details of emotions that cannot be conveyed by words. Users will use the stickers to empathize with ABC Mouse'sfeelings and feel affectionate for the characters. In this way, it would enhance the brand value as well.